Submitted 5 months 2 weeks ago by feeds_user. 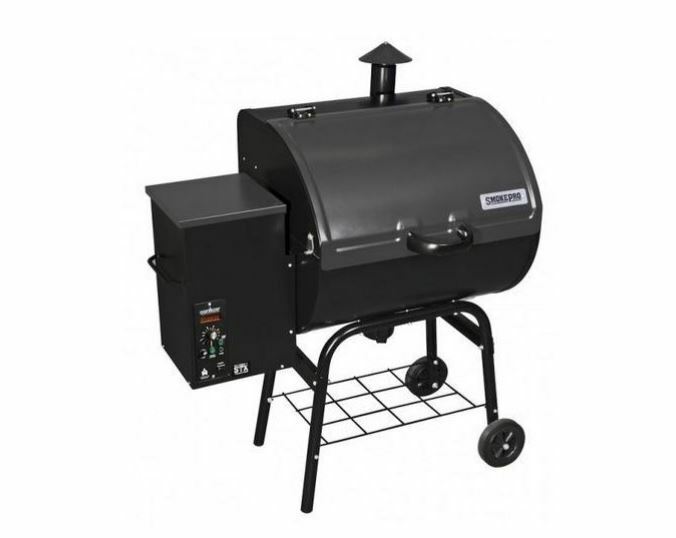 Product Info for Camp Chef SmokePro STX Pellet Grill Deliver each steak cooked to perfection and impress your friends with your culinary skill when you use the Camp Chef SmokePro STX Wood-Fired Pellet Grill. With ample prep space, these Outdoor Grills from Camp Chef let you stay with your grill, enjoying a cold drink, instead of making multiple trips in and out of the house. Monitor both cooking temperature and internal temperature on the digital display so you can cook each cut of meat to order on Camp Chef SmokePro PG24STX Pellet Grills. Choose braising, smoking, grilling, baking and/or searing with this versatile appliance. Get the distinctive flavor of wood with the convenience of charcoal cooking with your new Camp Chef SmokePro STX Wood Pellet Grill/Smoker. Specifications for Camp Chef SmokePro STX Pellet Grill: Color: Black Product Weight: 113 lb Fuel Type: Wood Pellets Stove Type: Wood Burning / Coal Stoves Field Maintainable: No Auto Igniter: Yes Features of Camp Chef SmokePro STX Wood Pellet Grill/Smoker PG24STX: Digital temperature control and display. Automatically maintains cooking temperature. Full cooking heat range, 160F up to 500F. Smart Smoke technology maintains optimum temperature range to produce the most smoke possible. Continuous fan provides even heat and smoke distribution. Bake, braise, smoke, grill, and sear all on one appliance. Stainless steel firebox. Sear box compatible. Stainless steel temperature probe with convenient storage port included. Jerky rack compatible. Silver vein finish. Roller wheels for convenience. Grease management system. Ash cleanout system. Slot for additional warming rack (rack sold separately). Slot for additional front shelf (shelf sold separately). Grilling Area Dimensions 19.5x22 inches. Total Rack Surface Area 429 sq. in. Side prep shelf dimensions 10x10.5 inches. Large Hopper capacity 18 lbs of pellets. Package Contents: Camp Chef Smoke Pro STX Pellet Grill & Smoker PG24STX Meat Probe Utility Rack Camp Chef No-Hassle Warranty Here at Camp Chef we stand by our products and take pride in our customer service. Because of this, your new Camp Chef product comes with a No-Hassle Warranty. What does that mean? It means that if we did something wrong, we will make it right. We guarantee our products to be free from defect in all materials and workmanship (excluding paint and finish). We will replace defective parts so you can get back to enjoying your product as soon as possible.